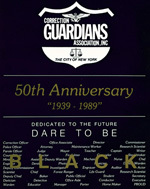 Reduced image of cover of souvenir journal for NYC Correction Guardian Association's 50th anniversary in 1989. 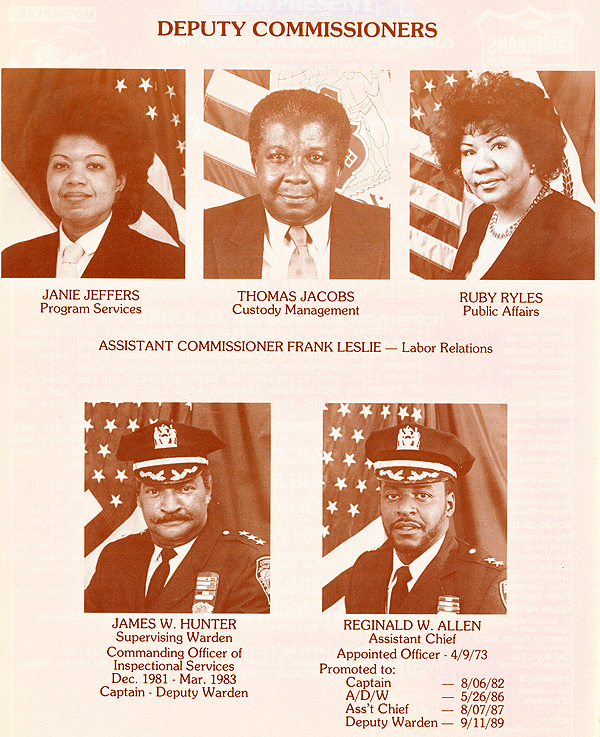 In 1989, the NYC Correction Guardians' published a 50th anniversary souvenir journal. Thanks to their past president and jubilee journal committee chairman, Prof. Errol D. Toulon, the New York Correction History Society has been able to extract image and text excerpts to mount this 10-part web presentation. This is Part II. Images and text below are from Pages 4, 5, 6, 14, 15 & 19. Journal pages 4 & 5. Click image. Use browser to expand view and 'back' button to return. JOB — Captain Kevelier is assigned to the NYC Dept. of Correction Training Academy as the Post Entry Level Training Coordinator where all in-service training for the department is handled. During her tenure she’s had the opportunity to work in the Co. rectional Institution for Women, Brooklyn Court and the Training Academy as an instructor. Her success in passing a recent test put her in line for promotion to Warden Level 1. BIOGRAPHY — Dianne Kevelier resides in Brooklyn with her husband Alfred Smith and daughter Falani. She is a member of the Bedford Stuyvesant Brownstoners; a group trying to maintain the African-American presence and ownership in the area, and is the Parent’s Association Corresponding Secretary at her daughter’s school, Williston Academy. Being one of nine children, she is proud to have earned a B.A. majoring in Education and Psychology and a M.S. in Remedial Reading Education from Queens College. GURADIAN GOAL — To maintain an ongoing Officer’s Survival Class that will help African-American Officers succeed in larger numbers and move through the upward ranks of the Department. The classes review departmental rules, regulations and directives for better working knowledge of those policies and accepted practices within the department. MOTTOS — “OUR CHILDREN ARE OUR FUTURE” so “EACH ONE TEACH ONE” because “THE CHILDREN WE IGNORE TODAY WILL BE THE CHILDREN WE FEAR TOMORROW”.! 1877 First Black Federal Marshal was FREDERICK DOUGLAS. After serving a short term as Police Commissioner of the District of Columbia. 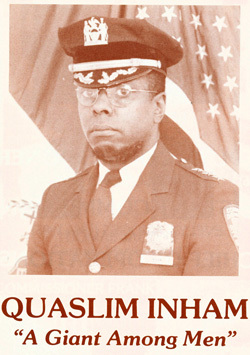 1951 First Black Deputy Police Commissioner in the N.Y.C. Police Department was WILLIAM L. ROWE, appointed by N.Y.C. Mayor Vincent Impellitieri, completing his term of service in 1954. 1959 LEONARD 12X WEIR, Founder and President of the National Society of Afro- American Policemen in the N.Y.C. Police Department. 1959 ARNOLD CREAM, aka JERSEY JOE WALCOTT became a Shefiff of his hometown - Camden, New Jersey after his boxing career until he was appointed New Jersey’s State Director of Special Olympics - a program involving sports projects for handicapped children. 1967 LLOYD 6. SEALY, Deputy Inspector, N.Y.P.D., appointed to Assistant Chief inspector in ~he Lindsay Administration. He was an advisor on race relations to the Mayor Mr. Scaly was law educated and was on the faculty of John Jay College of Criminal Justice when he died in 1988. 1969 JAMES A. THOMAS and JAMES C. HARRISON sworn in on April 29th, 1969 as Wardens. They became the First Black Civil Service Wardens. 1972 BENJAMIN MALCOLM - First Black Commissioner of the New York Department of Correction. 1972 Formation of the National Black Police Association in St. Louis, Missouri. 1972 JACQUELINE McMICKENS - First Black In-Charge of the Correction Academy. 1978 GERALD BROWNwas the First Black Chief of Operations of the New York City Department of Correction. GLORIA LEE was the First Black Female Warden assigned to a male facility. 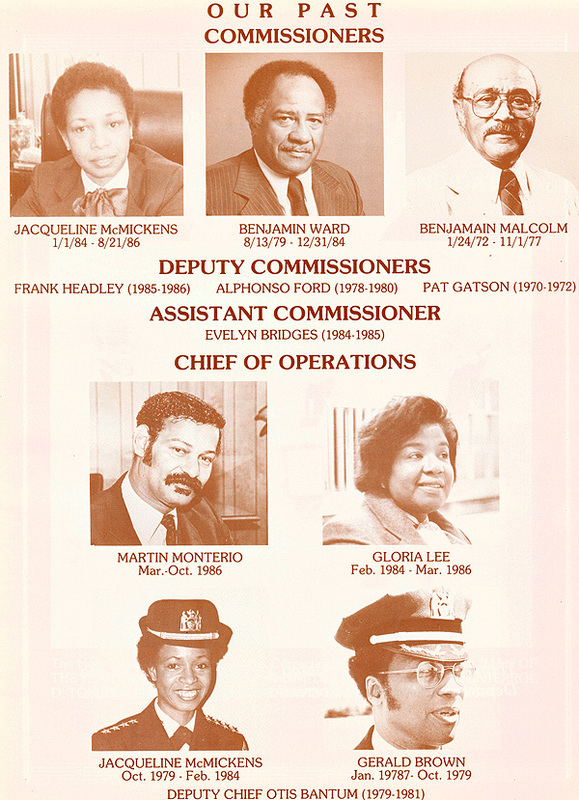 1984 JACQUELINE McMICKENS was the First Black Female Correction Commissioner, after having served as the First Female Chief of Operations. 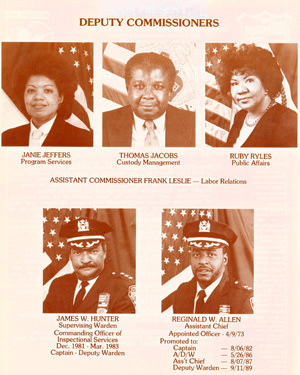 1984 The First Black Supervising Warden in the Department of Correction, N.Y.C. was ALEXANDER JENKINS a Former President of the Correction Guardians Association. 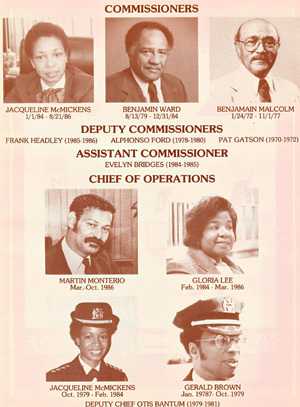 1984 BENJAMIN WARD was the First Black Police Commissioner of the New York City Police Department. 1989 The First Black District Attorney in N.Y.C. for the Borough of The Bronx is ROBERT T. JOHNSON. Part I -- Opening message, president's welcome greeting, journal committee salute. 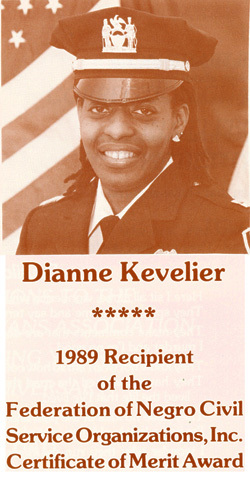 Part II -- Past Commissioners, deputies, et al; history; salutes to Kevelier, Inham. Part III -- History photos: Harrison & Thomas, Correctionaires, early Guardians. Part IV -- 19 captioned 'Memories of the Past' photos including one of Warden Vernon C. Bain. Part V -- 35 uncaptioned 'Memories of the Past' photos: outings, celebrations, ceremonies. Part VI -- 40 uncaptioned 'Memories of the Past' photos: outings, celebrations, ceremonies. Part VII -- 25 uncaptioned 'Memories of the Past' photos: outings, celebrations, ceremonies. Part IX -- 60+ names of deceased members listed by Correction Captains Association. Part X -- Sampling of full, half and quarter-page congratulatory "ads." Poem.